Can I sell the land on? A. Yes - you can sell the land at anytime after you have purchased. Can someone without residency purchase a US property? A. Yes, US residency is not required to buy a property in Florida. There are other plots of land for sale in Florida for less money. What’s the deal? A. There may well be. There are plots for less than half the price available, but Florida is a big place and these plots can be in an undesirable location, a long way from the main tourist hub in Orlando. Furthermore, it is unclear who you are buying these properties from. Fairhomes is a UK and European-based marketing and development company which has spent a great deal of time and effort ensuring that the land we identify to you is free from debt and claims by any other 3rd party. Much of the land we have we are intending to use for ourselves. How easy is it to build a property in the US? A. One of the great benefits of the USA as a place to build a property is the way in which they build them. Many people build what are described as Modular Homes (search Google). These are the kind of houses you see on TV which can be built in a few weeks. You see big trucks going up and down the Highways carrying parts of houses. There are many companies offering luxury-designed homes with kitchens fitted, bathrooms, garages, everything for between $150,000 - $250,000 depending on the size and specifications of the property. These companies can organise transport and installation to your new plot within weeks. There are also more traditional building methods where properties can be built on site by local contractors for a similar price range, however this method can take several months to complete. 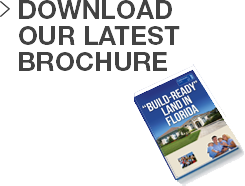 Fairhomes Land has several contacts with local building firms in Florida, that can build various types of properties. This is a disclosure document required under the Federal Interstate Land Sales Act, applicable to the interstate sale of subdivided lots. Every customer wanting to purchase a plot of land through Fairhomes will receive one of these documents. The purpose of the document is to ensure that, as a buyer, you are given full information about the land that you are purchasing and other invaluable information about the area, from where to obtain permits and utility connections, distances from hospitals, schools as well as details of the residents association. This ensures that buyers are properly informed and are not sold land which is unsuitable for building. As a responsible developer, we have vested significant time and expense in ensuring we comply with all aspects of the requirements: beware of unscrupulous sellers who do not provide this information. IA. LSA (or ILSFDA) is the Interstate Land Sales Full Disclosure Act of 1968. It was an act of Congress which passed in 1968 to facilitate regulation of interstate land sales, to protect consumers against fraud and abuse in the sale or lease of land. Fairhomes Land operates accordingly within this act, and supplies a full property report to customers prior to any land purchase. What Permissions do I need to build? A. Although all plots offered by Fairhomes Land are residentially zoned, and so are guaranteed to be granted building permission, you would still need to apply to the local council that your plot of land is located within. The building permits/permissions and processes vary in different areas of Florida, so you would need to find the local council and apply directly to them. No. Fairhomes Land will take care of the legal processes through a Title Agency in Florida. However, it is advisable that you should seek legal advice prior to completing any paperwork. What happens if I buy a plot and change my mind? A. Once the legal title of the property has been processed; it is not possible to change your mind. However, we understand that everybody has different circumstances. As such we provide a 7 day cooling-off period (including weekends and bank holidays) from the date of first payment before we process the title. What if I can afford the land but not to build a house? A. In many ways buying just the land and then selling it on in better times is the best option. This is because a majority of the lots we have on our books are selling for less than what it cost the developer to put in water, electricity, sewerage and roads. And you have the comfort of knowing that a large amount of legal and field due diligence has gone into acquiring the land. And the great news is that the right to build on the land does not expire. Even if you held onto it for twenty years, you would still be able to sell it as building land. In better times, just five short years ago, lots in many of the neighbourhoods on our books were selling for up to three times as much than the price you would be paying now. Those are deals you won´t find with just any real estate agency - or with a Barclays account! I can find really cheap properties for sale in places like Detroit. Am I not better off buying a property there? A. Yes, this is true - from as little as $25,000 for a house. We can´t speak for all areas in America, but we can tell you why we went to Florida. The problem with places like Detroit is there is very little projected long-term growth expected in those kinds of industrial areas. Florida has a thiriving tourist trade (as many as 86 million on the statistics we viewed) and with great weather going for it, it's a great place to build a second home. On the internet there are properties in the area which are going for around $50,000. What’s the deal? A. Buying a property can come with a number of risks. There may be loans and credit cards secured against the property which is why the owner is looking for a quick sale. In some cases, the land may already be owned by the bank and not the seller! The point is, you simply don´t know. At Fairhomes, we take pains to organise careful due diligence which means that you are buying with "clean title". In fact, your purchase comes with Title Insurance that guarantees this! While we are no substitute for your own diligence, our own careful legal and field diligence means that a lot of hard work -and costs- have fallen on us before we offer any plot on the market. Can I see the plot before I buy? A. Absolutely, if you want to travel to Florida and view it – of course you can! Alternatively, it might be easier to check it out on Google Maps and Google Street view. As all of our plots have roads already, they are easy to see on Street View. Can I choose the plot I want to buy? A. If it is available, yes. You can choose the specific plot you want. As soon as we have your reservation fee we will not offer this property to anyone else. A. The first step is to pay a reservation fee. This will secure the plot for you and make sure that the plot you have chosen cannot be sold to anyone else. You can make this payment over the phone by credit or debit card. The fee is usually $1,000 US Dollars. (All payments are made in dollars to avoid issues with exchange rate changes throughout the purchase process. To complete the purchase, you will then need to make an international bank transfer to an escrow account in the United States. You will be instructed how to do this once we have confirmed receipt of the deposit and drawn up the initial contracts. Does this give me US residency? A. No, you would need to apply for a US green card visa. If you own a property in the US and do not have residency status you may be required to leave the country every 90 days and then return. A. These are fees imposed by local government that will go towards the funding of community developments, such as schools for example. These fees are only payable if you chose to build a property on the plot of land. All plots of land sold by Fairhomes may be subject to impact fees, should you wish to build a property, and this would depend upon the local area in which the property is being built, as to how much these fees would cost. A Title Agent is a third party responsible for underwriting a title insurance policy. The Title Agent used by Fairhomes Land will be responsible for witnessing the signed contracts, and will issue the finalised deeds to the buyer upon closing. Aren’t you making a profit though? A. Of course, we are a company! We have found distressed land assets from banks or bulk sellers, created single plots, done legal and field research and put together sales and marketing to bring the plots to the wider market. This all takes time and effort. Title Insurance is a form of indemnity insurance, which insures against financial loss from defects in title to real property, and from the invalidity or unenforceability of mortgage liens. If you purchase land through Fairhomes, Title Insurance would be included within the overall price. Why do you have the land for sale? If you’re such a big company why don’t you use it yourself? A. In order to keep the prices low we need to source properties in bulk from a bank or a bulk seller. We look for packages of “distressed” assets – these are usually properties that have been returned to the bank, usually because the original owner could not afford the loan payments on it. We also look for commercial properties such as shopping malls, car parks or leisure facilities, or land that has not been designated so we can build large developments. As part of these packages we have large amounts of these individual build plots available. We thought it would be a great idea if we broke these packages down and offered them to individuals - meaning that anyone can take advantage of the current situation.